When should you create a wireless network? When you have several computers running in the same house. When you want your small office to be more efficient. When you are tired of wires running all over the house to connect computers. When you want the option of using a laptop or desk style computer without interruptions in service. These are all good reasons to install a wireless network. However, there are many different options to choose from when you go shopping for a wireless network. Some are created for in home use, but if you are running a business from you home these might not be the best choice for you. When you are choosing a wireless network check the speed and the area it will cover, there are small networks that cover around 75 feet, on up to systems that will handle a much wider radius. Take some measurements and be aware of the distances involved when you go to look for a network. Speed can also be an issue, if you are setting this system up in your home for personal use and you have several family members that play games online you may want to look for a network that offers faster speeds. Remember that for a wireless network to function you are going to need to install wireless cards in the computers that you want connected to the network. 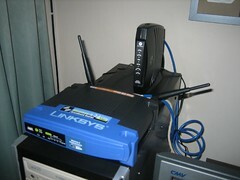 Once you have chosen the wireless router that best suits your needs, you need to connect it to your main computer. If you already have a router then you will be replacing it with the wireless router. Attach all the cables from the old router to the new wireless router. When you see green flashing lights on both the router and the modem, this signals that the router is recognizing an internet signal. You are not quite done. Power up the computer that the router is connected to and load the driver disc that came with it. This will request you to put in a username and password. The username is not important; many people just use admin as the password. You also need to set up security for the router; you don’t want anyone in the neighborhood running off of your internet service. There should be directions on how to access and set up the security you want in the installation book that came with your router. Once you have set up the security and password share the password only with those you want to be able to access your network. This could be only family members, or the employees that work in your business. Make sure that they do not share the password with other people as this will cause a breach in your network. Most laptops come equipped with a wireless card, but if you are using your wireless connection with desk top model computers you will have to install wireless cards in each computer so that it can access your wireless network.